Sea of Lies: Mutiny of the Heart is rated 3.9 out of 5 by 30. Rated 5 out of 5 by hermitcave from A pirate treasure, a secret love affair, a scheming woman, a faithful servant, and the life of a boy hangs in the balance Somewhere in the Carribian the drums beat as they bring the French Pirate, Oliver, to the gallows as the crowd cheers. As they place the rope around his neck, he defiantly bellers at the crowd that they may hang him but none will ever find his treasure and even challenges them by throwing his necklace at the crowd telling them it is a clue. A young boy, Jimmy, runs through the crowd and scoops up the necklace and runs off as a man watches him. He runs to your house and knocks on the door. You, Madame Adams, opens the door and Jimmy tells you that he went to the execution even though he was told not to and about the pirate's treasure and about the necklace. He gives the necklace to you and tells you he has to get home before his parents get upset. 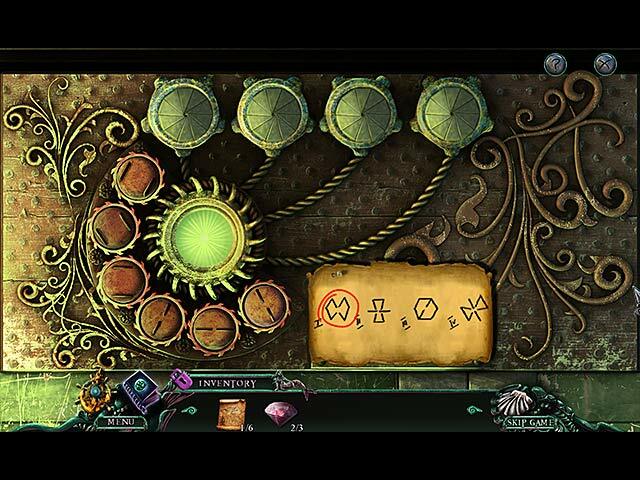 Examining the necklace, it emits a strange light and you see an image of Cerberus on it and three recesses appear that need to be filled. Someone knocks on the door, and a man, Jonathan Black, Groomsman for Baron LeFay, tells you the Baron wants to see you and that a carriage was waiting. At the Baron's estate, you see the Baroness sitting outside crying and she tells you that she knew the Pirate and gives you a piece of a map and tells you not to tell the Baron about it. Inside, the Baron mentions he knows of your reputation as an investigator of mysteries on the seas and he wants your help for a significant reward but you have to prove yourself first by opening his safe. Inside the safe you find your personal family ring and when you returned to the Baron, you see the Baron and Groomsman holding Jimmy at gunpoint. The Baron tells you that to save Jimmy, you will need to outfit a ship with supplies and a crew and find the treasure and bring it back to him. While collecting supplies and a crew, you find out that the Baroness was once in love with Oliver and shared his pirate life but wanted riches and a simpler life so she left him and married the Baron. Aboard the ship, the crew trys to mutiny but a storm wrecks the ship and you and the Baron's wife washed up on the shore of the island. She had snuck aboard the ship. You now have to find where the treasure is and figure out how to get back to save Jimmy. Touted as based on true historical events, the plot, though not new, is presented in a complicated, twisting and exciting story that is enhanced with excellent graphics and very detailed indoor and outdoor scenes that showed that the developers put a lot of time in its production. You explore 19th century locations full of suspicious characters whom seem to have their own agendas. Voice acting was very well done with only a couple of characters that could have done better, one being the Groomsman with a snooty attitude. The music fit into the pirate theme very well making it more entertaining. There is a journal for the story and clues with an objectives tab. There is a jump map with action areas indicated. Inventory puzzles and minigames were not anything new but was presented to suit the pirate theme and were nicely done. Some "plus" items are found that require further manipulation before they can be used. There are a lot of multiple copy items scattered throughout locations that you have to find before you can use them. 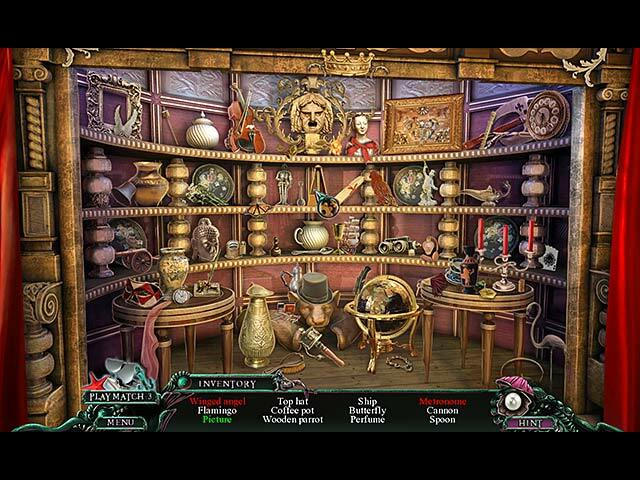 Hidden object scenes were very interactive and well intergrated into the story so they feel part of the story. There are minipuzzles embedded in the scenes that you work through to find an object and some zoom areas with silhouettes to find. Many objects were animated and one i really liked was the bottle with a note in it and the way it was turned upsidedown and shook. You can switch to a match 3 game instead of doing the hidden object scene. A dramatic pirate tale that will provide an enjoyable several hours of diversion. Rated 5 out of 5 by lilyboo2u from enjoyed it immensely It was a nice not too long enjoyable game. Puzzles were not very hard, but it made up for the good story. Recommend! Rated 5 out of 5 by nwind from Great Story I really liked this one! The story was great. I could perhaps have been a bit more challenging but for me, the puzzles made sense and were less aggravating than most, the HO scenes we not difficult but had an extra twist and the story was great. I hope there will be sequels! Rated 5 out of 5 by denniann2 from i really liked this game... you are a lady investigater looking into a case of stolen treasure. the baroness has a very jealous husband and he hangs the man that he thinks is having an affair with his wife. he doesn't believe there is nothing to it no matter how much it is denied. played casual, low sound. hints charge in about a minute. skips the same. i finished some of the mini games. great graphics and you have HO scenes that had interactive items, hidden items and just plain hidden items. most of them are not hard to figure out. you also collect items along the way that have to be blended to use so if you get to a point where no hints are showing on the map them you need to blend something. you have a diary with objectives but as you complete them it shows on the game scene and the next one is shown. the map is interactive and also shows you where you need to go for things that need to be done. sequel....i think so. Rated 5 out of 5 by rosekaufmann from SWASHBUCKLING FUN This game is so much fun that time flies. And it was stress-free fun! WHAT YOU GET: Journal with objectives Automatic widescreen 3 volume levels Very well done voice overs Realistic sounds 3 levels of difficulty Match 3 instead of HOS Jaunty music added to the atmosphere Interactive map showing objectives (and locations with available actions if playing casual), which can be changed during gameplay GAMEPLAY: The graphics were hand-drawn and beautiful. Lots of attention to detail in the environments. Story took place when pirates roamed the earth and the interaction between the characters keep your interest throughout. There seemed to be quite a bit of underlying humor in the drawings and dialogues. The HOS were incredibly fun. Everything was easy to find, but within each HOS was a silhouette mini-HOS. I think it was the mix of the two HOS types that contributed to the enjoyment. You could play Match 3 if you wanted, but I was having such a good time playing the HOS that I didn't even bother to try the Match 3s. I don't recall when I had such fun playing HOS. Puzzles seemed to be in an equal ratio to the HOS. They were easy but were also a lot of fun. Objects sometimes had to be combined to get a needed item to progress the game. There wasn't any wandering around trying to figure out what to do next. Very logical gameplay. The enjoyment and entertaining value of this game makes it a definite buy for me. Rated 5 out of 5 by JustTheFacts from Adventure On The High Seas BASED ON COMPLETED CE GAME GAME SUMMARY Loads to like about this game. Looks good, sounds good. Fun gameplay with lots HOPs and puzzles. Useful hint and map. Choice of difficulty. A story based on historical facts, that at times seems confused but is definitely intriguing. Pirate’s treasure, evil baron, a little romance, and of course, adventure on the high seas. You gotta love it. A couple of things I noted: • VOs were synched to a portrait image of individual, while the person in the scene remained still. • There were items which could be combined in inventory. • It’s always nice to see a change in the weather. • Each HOP had a mini-HOP with object outlines within it. • The scroll holding the collectible pages stayed unravelled until you found the page in that scene. (CE only) (Please look in the CE thread for my full review of this game.) ****BONUS CONTENT REVIEW**** In total, I must say I don’t think the bonus content lives up to the main game’s standards. The main game finishes well enough, and if you didn’t know there might be more to the story in the exclusive chapter, I don’t think its ending would frustrate you. Yes, we go one step further, but the information isn’t vital. The bonus chapter lasted only 50 mins for me, which is less than my usual time. The game area uses a couple of old scenes with minor changes and about 7 new ones. Likewise, there are some new HOPs using interactive list, and some old ones with object outlines only. The puzzles (about 4) were all new, but were considerably easier than the ones in the main game. There are collectible pages of a code, which get entered into a book found in the achievements room, and at each stage of the alphabet a section of interesting trivia about this pirate’s true career is decoded. This was definitely fun. The achievements are not too interesting, almost all being fairly predictable. The gallery includes: game wallpapers and pictures of the developer’s team having fun (which they seem very good at), movies, music, a ‘making of’ home movie (funny), and replayable HOPs and puzzles. There is, of course, also a built-in Strategy Guide. Would I buy the CE again? Probably not, because the bonus chapter was somewhat disappointing. As an SE, this is an incredibly good game and worth every cent! 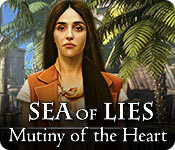 Rated 5 out of 5 by stevefrei from Wonderful adventure game Sea of Lies: Mutiny of the Heart is an exceptionally well-made game in every respect. Engaging storyline, convincing characters effectively voice acted, evocative music appropriate to the pirate theme, and well-executed graphics in a realistic style. 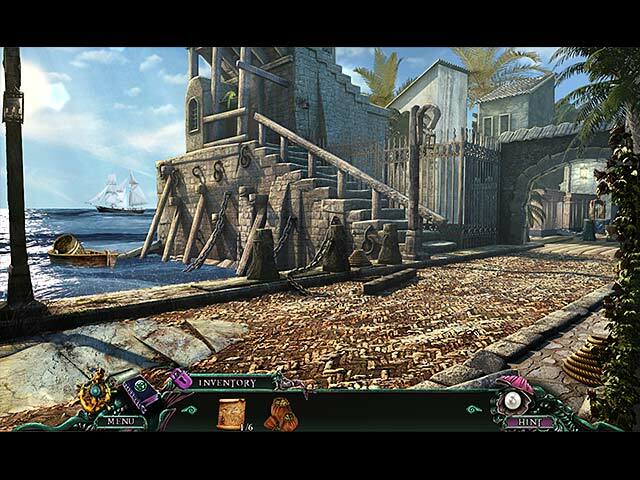 Gameplay is seamless, interface is user-friendly, puzzles are fun to solve with a varying level of challenge, hidden object scenes are interactive, inventory includes occasional combining of objects. (Have I missed anything?) In short, hat's off to developer Eipix, this is everything you could possibly ask for in a hidden object/adventure game.